Game of Thrones is coming back to HBO, did you know that? I mean, how could we miss it—am I right? I’m guessing that you’ve been waiting like everyone else with baited breath to find out what happens in the final episodes. Same. Well, we’re super close now to the new season premiere, so if you’ve already read all of George R. R. Martin's books in the Song of Fire and Ice series, may I suggest some of these Young Adult epic fantasies to get you by while you wait? You’ve heard about it, you’ve read about it – heck it was the Tonight Show with Jimmy Fallon’s Summer Reading pick. Just do yourself a favor and read this epic and action packed magical fantasy – you won’t be disappointed. So, so, so much murder, you guys, just… you’ll be into it, I promise. After he eats the sin of a royal, Taj, a talented aki—or sin-eater who consumes the guilt of others whose transgressions are exorcised from them by powerful but corrupt Mages—is drawn into a plot to destroy the city. He must fight to save the princess he loves and his own life. And if you like it, there is a sequel called Crown of Thunder, in which the adventures of the powerful and the powerless continue! Raised to be a warrior, seventeen-year-old Eelyn fights alongside her Aska clansmen in an ancient rivalry against the Riki clan, but when faced with her brother's betrayal—and driven by a growing love for her brother's friend Fiske—she attempts to unite the two clans. Clan warfare for the win, I guess? If you aren’t already aware of Holly Black’s ability to weave a seriously dark, haunting fantasy, I can’t really help you here. But definitely do yourself a favor and check out her entire catalog. A New York Times Bestseller and soon to be a Netflix series – get in on the ground floor with this one! While most of the world has drowned beneath the sudden rising waters of a climate apocalypse, Diňtah (formerly the Navajo reservation) has been reborn. The gods and heroes of legend walk the land, but so do monsters. Maggie Hoskie is a Diňtah monster hunter, a supernaturally gifted killer. When a small town needs help finding a missing girl, Maggie is their last best hope. But what Maggie uncovers about the monster is much more terrifying than anything she could imagine. Monsters and heroes and gods, oh my! So there you go – a few of my favorite epic fantasy picks to get you through the wait before the upcoming new season of Game of Thrones. Whether you love the series for the dragons or the complicated family ties or the bloodshed, there’s something here for everyone! Have other favorite fantasy / sci-fi / medieval-themed titles to suggest? Let me know in the comments! 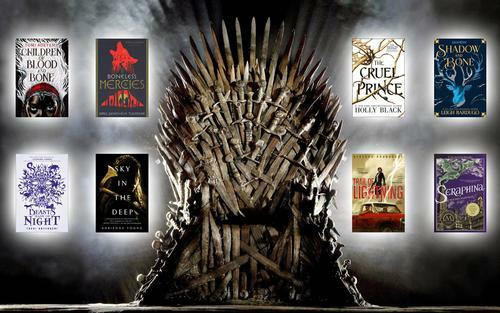 Check out these Young Adult epic fantasies that would be right at home on the same bookshelf as George R. R. Martin's Song of Fire and Ice series. I recommend Alex London's Black Wings Beating! Yes! Black Wings Beating is and excellent one - thank you, Laura!